1. 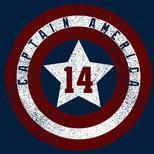 Every team was given a home, away, and alternate jersey. The alternate can be an entirely new design or a throwback jersey. 2. Every team's uniform (MUCH to the disappointment of fans) featured the Nike flywire collar. 4. Nike was to not redesign a teams logo or logo set, however, they were given the go ahead to change colours for a handful of teams as well as bring back some retired logos or promote alternate logos to primary marks for a handful of teams as well. 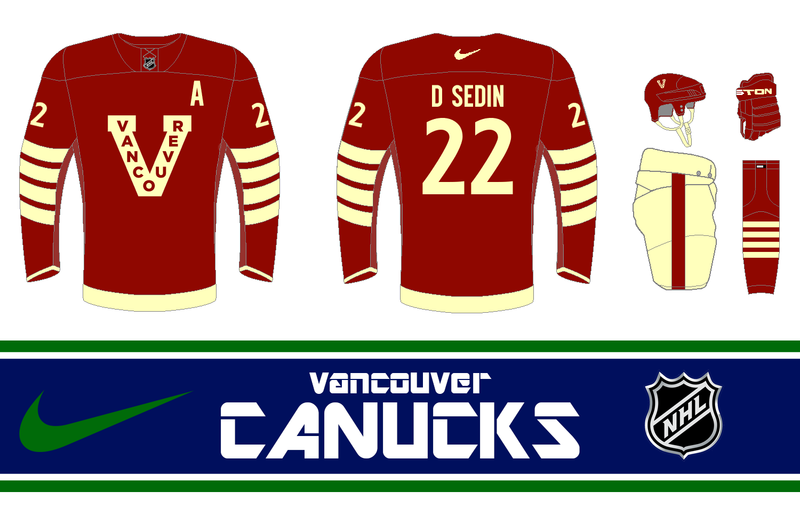 To kick off our journey, we start with the Vancouver Canucks. 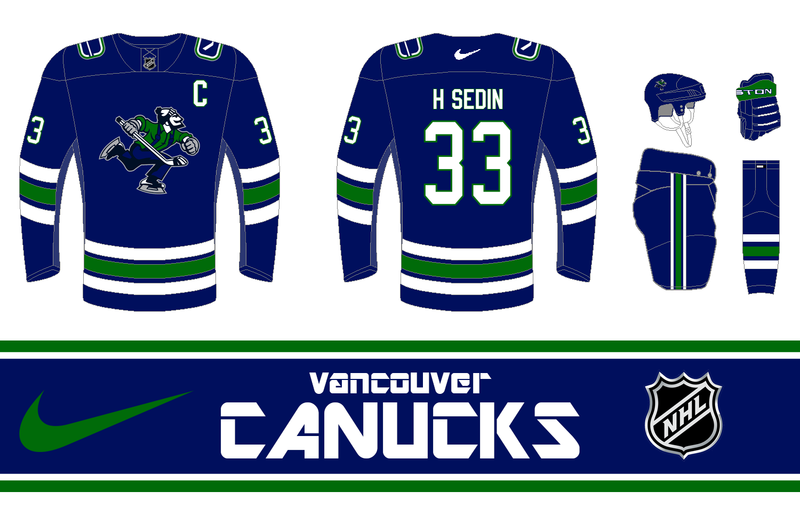 No strangers to redesigning uniforms, the Canucks finally decided it was time to create a lasting brand image. Their Johnny Canuck logo was promoted to the primary crest of the team, and the orca whale was retired. The team made slight modifications to both their home and away jerseys, and retained their popular Vancouver Millionares throwbacks as the alternate, minus a few stripes on the sleeves. Overall the city of Vancouver is ecstatic! The Sedin twins and Kevin Bieksa modeled the new Nike looks in front a crowd at Rogers Arena, and jerseys began flying off the shelves at the team store. The Canucks had finally gotten it right. Our next visit is across the continent in Sunrise Florida. 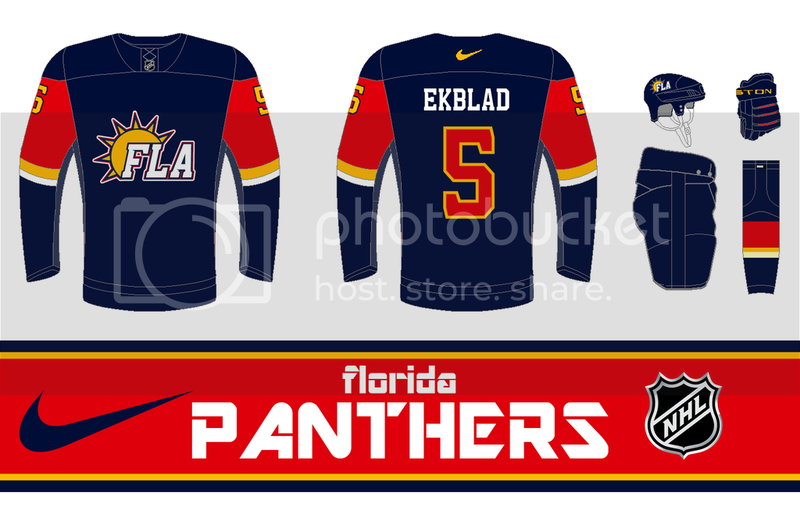 Aaron Ekblad, fresh off winning the Calder (yes, that's my prediction), modeled the new look for the Panthers. 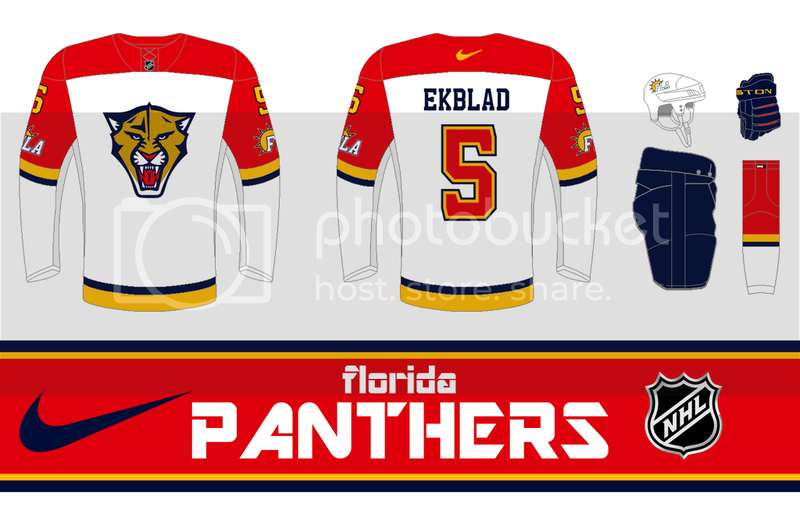 What fans were expecting was a return to the traditional, sharp uniforms worn through the 90s and early 2000s, but what fans got was Nike's version of Reebok's already lame template coupled with the resurrection of the logos from Florida's failed third jersey in the early 2010s. Gone is the full bodied Panther, and in is the modernized Panther head. Nike unveiled their first gimmick on these Panther's jerseys: sleeve logos beneath the TV number, a move welcomed by some and cringed at by others. The alternate jersey was instantly nicknamed the "BLA" as many can see why. Overall, the look was welcomed by young Panthers fan poised for a prosperous future, but hated by long time supporters who wanted the team to bring back the "glory day" uniforms. The rest of the league, however, doesn't seem to care what the Panthers are wearing as many anticipate the team relocating in the near future. Our last stop for the day takes us to Pittsburgh. The Penguins took the Nike redesign in stride and once again returned to the city's famous colour scheme of black and yellow (Sport Gold for those of you who think "yellow" isn't an athletic enough name for a colour). 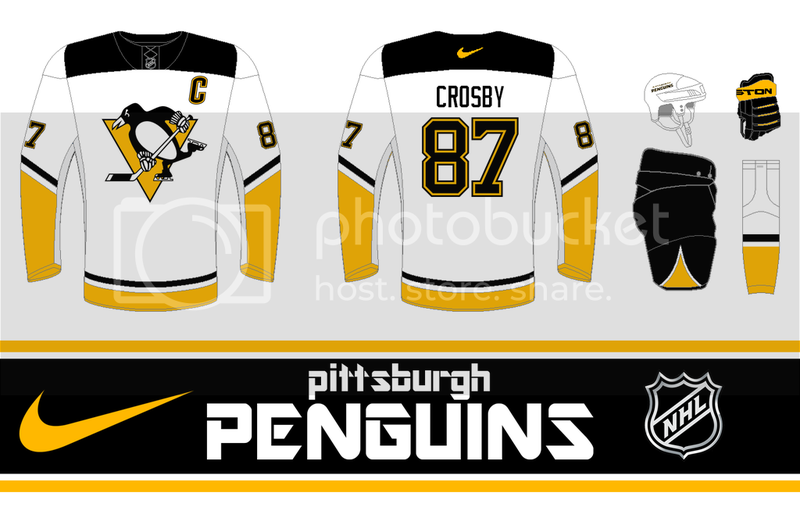 A video was released on the team's social media pages of captain Sidney Crosby wearing the new threads. Gone is the templated black and vegas gold, for good. The black jerseys received phenomenal reviews, however the fans were skeptical about the road whites, saying the jersey looked unbalanced. However, on the ice, the Penguins looked sharp, except that is in their yellow alternate jersey. Despised by fans, the team retired it and the end of the season and gave fans (you guys!!!!) the chance to design and submit a new one for the team going forward. Please, let me know what you think of the series so far, and let me know what teams you would like to see next! 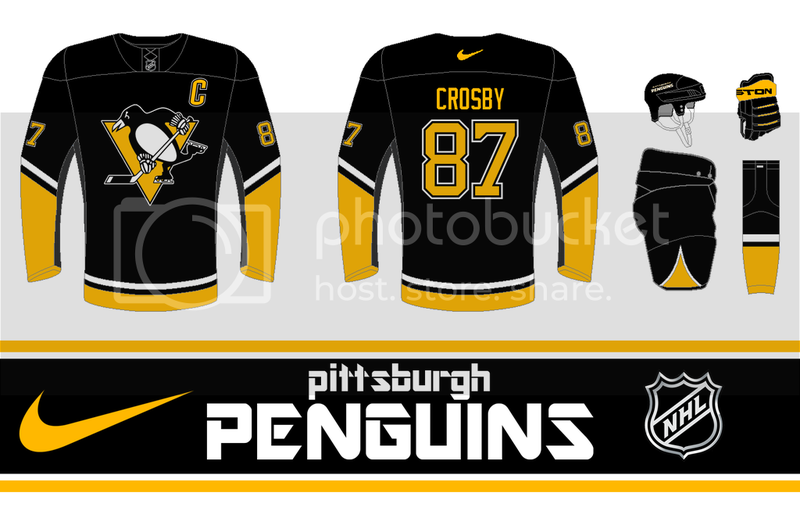 And feel free to submit some new Pens alternate jerseys as well. Thanks! And trust me, you'll see some really good designs going forward... and some that'll be REALLY bad. That's the whole point of the series. I like that you're going for a realistic approach and not just trying to please everyone. You make things more interesting doing it that way! I am really excited for what you have in store for this series. Even though they aren't always the most visually pleasing, I'm glad you're going to commit to the bit and go full Nike template for as much as these as possible. 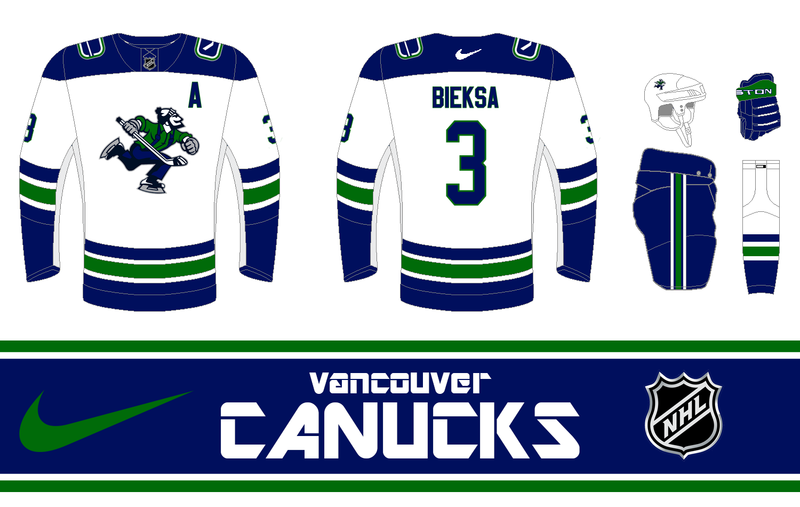 Big fan of the Canucks look too. Ever since I discovered Jonny Canuck, I've thought he should be their primary. I really like what you're doing here. This is exactly the kind of thing Nike would pull. 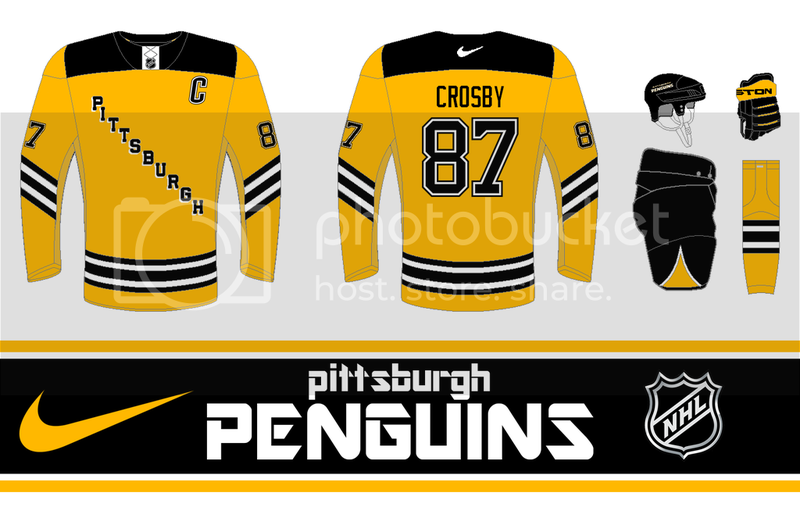 As usual it looks best when they keep it simple like the Pittsburgh set which happens to be a major improvement. Incidentally the Bruins felt the same way about Pittsburgh when they changed their uniforms in 1980. In what conceivable, fathomable, comprehendible universe is that Canucks uni not better than their current ones with the deformed, cartoonish, discoloured ad logo that doesn't even relate to the team name, with an awkward wordmark above it to sell jerseys during the Olympics? Johnny Canuck is love, Johnny Canuck is life. If you're the Vancouver Canucks. Finish all 30 teams. These look really good. Day two of Nike uniform unveiling brings us out west. The Calgary Flames decided to listen to fans for their little rebrand. Gone is the black flaming C on the home jersey, and replacing it is the more popular white crest from the 90s. The uniforms are much simpler, and gone are the hated flag shoulder patches. The alternate logo created for the team's final Reebok 3rd jersey becomes the new full time shoulder patch. The Flames were also the first team to attempt a striped collar on the new Nike template. The team took the opportunity not only to unveil their new uniforms, but also to announce that Sean Monahan will be wearing an "A" on his jersey going forward. And last, but not least, the Flames showed off their new black alternate jersey featuring a unique striping pattern. The jersey, outfitted with its own matching set of pant covers, would end up being very popular among fans. Our next stop is in the Lone Star state with the Dallas Stars. The Stars decided to keep their current green look almost the same. The only difference was a black outline added to the numbers and the black text for the players name on the away jersey. The Stars did make an attempt at an alternate jersey, but Nike found a way to make it look awkward. The fans loved the look of the state of Texas logo on the black background, but not the jersey itself. The team ended up selling far more black t-shirts than jerseys and retired the sweater at the end of the season. 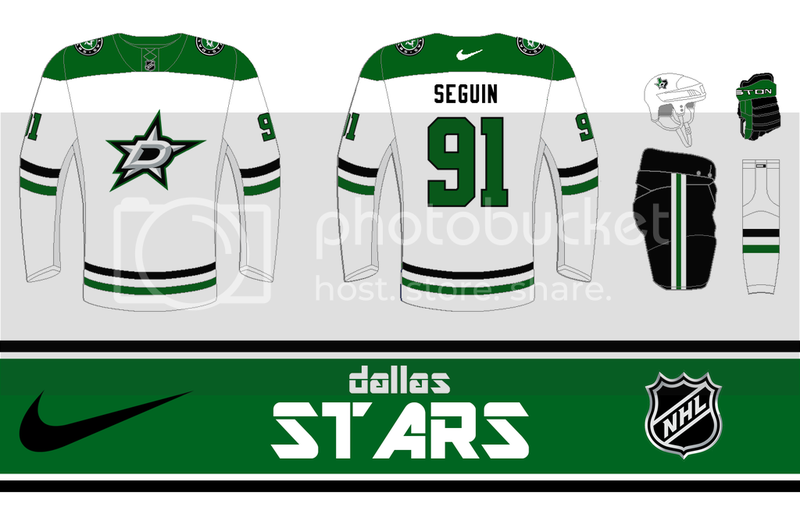 I REALLY like those Stars alternates. Sharp! Those all look fantastic, especially the alternates. On the Flames home jersey you could maybe swap the black and white on the arm stripes so that the white is the more prominent one just for consistency, but it still looks great. 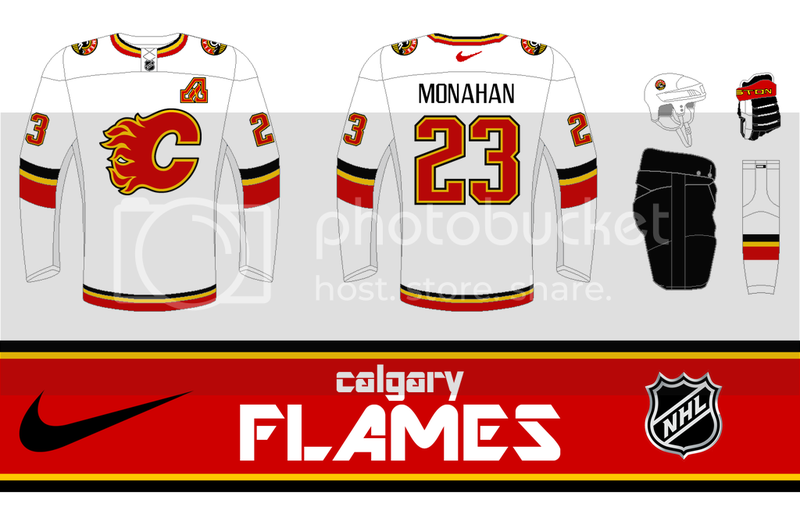 Big fan of the Flames concept. Nice, minimalist striping and welcome use of the white logo. Stars are a lateral move, which is to say they look good.